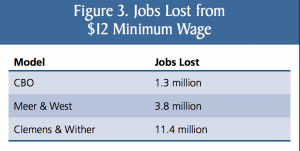 By eliminating jobs and/or reducing employment growth, economists have long understood that adoption of a higher minimum wage can harm the very poor who are intended to be helped. Nonetheless, a political drumbeat of proposals — including from the White House — now calls for an increase in the $7.25 minimum wage to levels as high as $12 to $15 per hour. – Affect 38.3 million low-wage workers. – Cost 3.8 million low-wage jobs. – Only 5.8 percent of the total income raise would go to low-wage workers who are actually in poverty. As the minimum-wage debate proceeds, it’s important to keep in mind that work itself benefits those of modest means. In other words, this is reverse of Robin Hoodism: taking jobs and income from the poorest to give to those who are better-off. The wealthy, whom demagogues now attack, would be untouched. The first job, even at relatively low pay, provides that first step on the ladder of upward mobility. Eliminating those rungs on the ladder threatens the future of workers who are starting out today. There are far better ways — including the Earned Income Tax Credit, targeted wage supplements and, of course, a more effective public-education system — to assist low-income Americans and to make work pay, while not reducing job growth. As this paper makes clear, the poor cannot afford counterproductive initiatives advanced in their name but harmful to their lives.